Successfully Added JESY J9S Rugged Phone - Helio P10 Octa-Core CPU, 4GB RAM, 6150mAh, Wireless Charging, Android 7.0, 5.5-Inch Display, 16MP Cam to your Shopping Cart. With the JESY J9S rugged smartphone at your side, you’ll be able to enjoy the latest Android features anywhere you’re at. 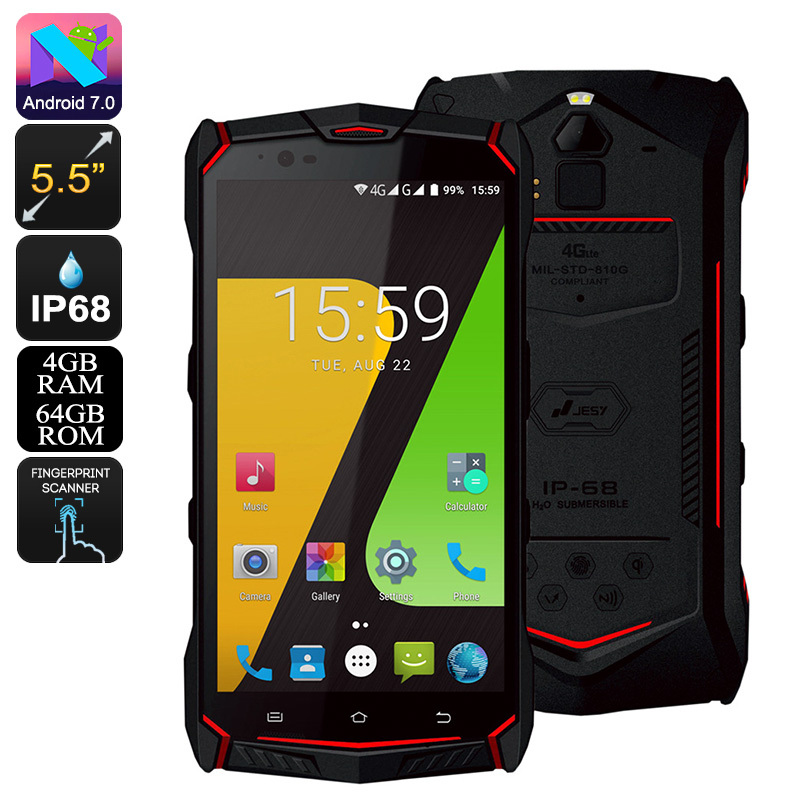 This extremely tough Android phone comes with a fully rugged IP68 body. This makes your smartphone not only waterproof, but also resistant to drops, dust, and low temperatures. Thanks to this, you’ll be able to carry along and use your Android phone literally anywhere you’re at. It furthermore comes with a whole bunch of sensors as well as a GPS and other outdoor features. Additionally, your rugged phone packs a professional-grade 16MP rear camera. This snapper allows you to shoot breathtaking images and video of all your upcoming outdoor adventures. The JESY J9S rugged smartphone features a beautiful 5.5-Inch display. On this display, it lets you enjoy all your favorite media in crisp 1080p Full-HD resolutions. Underneath the screen of this Android phone, you’ll find the powerful Helio P10 processor. This Octa-Core CPU has been clocked at 2.0 GHz. Along with a whopping 4GB of RAM, this rugged Android phone is sure to meet all your smartphone demands. It runs on an Android 7.0 operating system for a smooth user experience and comes with 64GB memory. For those of you who need even more storage, the rugged phone supports an additional 128GB external storage via its SD card slot. This rugged smartphone packs a powerful 6150mAh battery. With this cell, you’ll be able to enjoy 7 hours of continuous usage time and an unbelievable 200 hours standby time. Whenever you’re running low on juice, your battery can be charged wirelessly through NFC. With this Android phone at your side, you’ll never have to worry about running out of juice again. To make sure that you’ll always be within reach of friends and family, your Android phone supports Dual-IMEI numbers and 4G. This means that you’ll always stay connected no matter where your next adventure may take you. The JESY J9S Rugged Smartphone comes with a 12 months warranty, brought to you by the leader in electronic devices as well as wholesale Android phones..